Billroth 2 is a surgical procedure in which the stomach and intestinal upper portion i.e. jejunum are connected via new route. It is also known as gastroduodenostomy. There are two purposes behind Billroth 2, 1st is to provide the bypass way for the contents of stomach and 2nd to provide a pathway for the draining of stomach contents. Billroth 2 procedure is more effective, simple and faster as compare to Billroth 1 but there are many complications seen with Billroth 2 e.g. excessive reflux of bile occur during surgery. It is considered a better alternative for totally laparoscopic distal gastrectomy (TLDG). In gastrojejunostomy, a jejunum loop is used for connection. This loop is either attached from the front side of colon i.e. retro colic or back side of colon i.e. ante colic. But retro colic surgery have an advantage over ante colic surgery as it is shorter in size as compare to the later one. 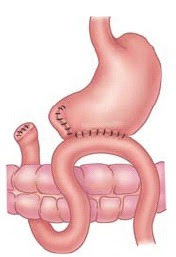 In this surgery, the loop upper end is stapled with the stomach and closed the end and the other end of loop is stapled with the jejunum and closed. And then this pathway is opened for the draining of stomach contents into jejunum. There may be many complications associated with Billroth 2 procedure as compare to Billroth 1 procedure. There may be increase in risk of adenocarcinoma of stomach if the surgery is not performed properly. Afferent loop syndrome may also occur in which there are problems in the loop occurs which is stapled between stomach and jejunum. Gastrojejunocolic fistula is also a complication. Dumping syndrome (in which after surgery the gastric contents bypass rapidly leading to rapid gastric emptying as a result weight loss occurs). After gastric surgery it is very important to maintain diet to avoid any kind of problems like dumping syndrome. As dumping syndrome show symptoms when too much sugar bypass to jejunum. Take supplements to overcome the vitamin and mineral deficiency. After surgery, there may be low blood sugar level after every meal taken by patient so the blood sugar level should be monitored regularly to avoid any complication. Patient may feel nausea after every meal, so the patient have to take small quantity of meal that can digest easily. Patient should not lift heavy objects and should not heavy or fatty food. Patient should take vitamin and mineral supplements to overcome the deficiency of nutrients. If too much flushing occurs then the patient should consult doctor because it is the symptom of dumping syndrome.